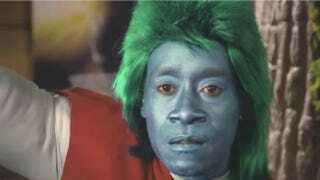 Last year Don Cheadle portrayed an unstable Captain Planet, in wich the green-haired environmentalist snapped and started turning every human into a tree. It was beautiful. And now Captain Planet is back! With most of the Planeteers dead by Captain's hands, only Ma-Ti is left to cower under Planet's new rule. There is just nothing better than an unhinged Cheadle in tights. Nothing.